If you want to learn Portuguese, basic grammar is going to be very important. This includes subject and verb agreement. Rather than bore you with a bunch of rules, I’m just going to lay out a few basic phrases to help you get by. If you want to learn Portuguese, though, before I dive in, I should point out one slight grammatical issue. Every noun in Portuguese has a gender. No matter what you’re talking about, know that it has to be either masculine or feminine. – if you need to describe it, the genre must match. The words ending in “o” are usually masculine and take the masculine articles. For example: O menino, O carro, O gato branco and the words ending in “a” are feminine and they take the feminine articles. For example: A menina, A casa, A gata branca. Eu estou bem, Obrigado I’m fine, thank you. Prazer em conhecer você Nice to meet you. Desculpe, Eu não entendo você. Sorry I don’t understand you. Você pode repetir, por favor? Can you repeat please? Aonde é o banheiro? Where is the restroom? 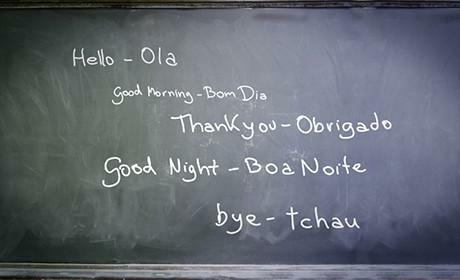 TIP: to say “thank you”, a man would say Obrigado, while a woman would say Obrigada. One of the best tips if you want to learn Portuguese is to pick up the pronouns. Portuguese does not have the “it” pronoun, and uses ele and ela instead, depending on if the noun is masculine or feminine. In Portuguese, the possessive pronouns vary in gender (masculine and feminine) and number (singular and plural). Sometimes they vary with the person who owns the items in question, and other times they agree with the object that is owned. I hope this lesson will make it really easy to learn how to use the possessive pronouns.